Faded rugs and convertible shelf flap. On my recent purchase of a 2002 millennium yellow convertible. Even though the original owner I got it from had it garaged all the time and never drove it in bad weather things still faded from short times with the top down. The two biggest areas of concern is the sunvisors and the flap that is on the rear shelf when the top is up but the sun comes through the back window so nothing is safe. The Sun Visors are the same in fact they are almost a consumable. The following will work on most anything in the interior. 1-. Clean the items you want to dye with a good shampoo. I use Blue Coral interior rug cleaner. It'll work on any surface but don't use the brush in cap on fabric or leather covered items because it'll ruin anything except carpet. I use a soft brush, a unused shoe brush works great!!! Although there are many great products I personally prefer this brand. As with most cleaning agents be sure to rinse with clean water. Wet vacs can really help here. 2-. After everything is dry (you must rinse completely) over night if needed, Mask off around the whole area. Cover the seats and the rest of the interior with drop cloths of which old sheets are perfect. 3-. For coloring I use dupicolor Vinal spray paint. It's made especially for vinal and fabric. Don't try to cover everything in one coat. If you have to color any hard items be sure to use adhesive promoter. It'll take a few lite coats for it to sink into and fully blend in. Obviously black is the easiest color to work with. You can use this on rugs to so again clean and rinse makes for a betterjob. 4. After the items dry, use a gentle bristle brush to return the painted items back to there look and feel. Depending on what you are painting make sure it's dry before brushing and returning to service. 5. Take off the masking tape and cloths and remove any over spray with lacquer thinner but only use very very little on a clean rag. I'll try to post some before and after pics as soon as I take some recent ones. Good luck and happy cleaning. PS: if you have any questions please feel free to contact me anytime. Join in and write your own page! It's easy to do. How? 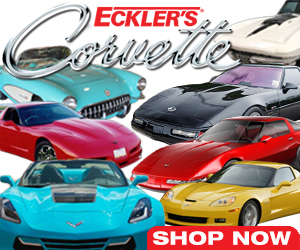 Simply click here to return to Corvette Web Central invites you to add your own content to this site!.